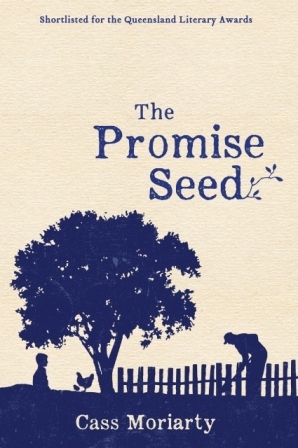 Cass Moriarty’s The Promise Seed, which was shortlisted for the Queensland Literary Awards in 2013, delves into the lives of two, at first, very estranged characters: an old man and a young boy. Both grew up in different eras and don’t seem to have anything in common, yet throughout the novel their lives begin to unravel and weave together in the most unlikely ways. The Promise Seed is an incredibly poignant piece of fiction that has the reader absolutely gripped from beginning to end. Moriarty exhibits incredible grace and style throughout the story, and it’s an absolute delight to see an emerging writer burst onto the scene like this. We are moved between first person and third person narrative; giving a multitude of dimensions to each and every character. We follow the old man, unnamed, and the young boy, also unnamed. The old man has a complicated past and has spent most of his life without a family or a caretaker of any sort; growing up in youth homes and boarding schools until being shoved out into the real world. He’s been through a heck of a lot for someone who has only ever just tried to love and be loved. It’s evident from the moment we meet him that he has always been incomplete in some way or another. The boy has also experienced a lot of hardship, in fact too much for a child of his young age. The boy lives next door to the old man and lives with his mother who is struggling to raise a child as a single parent. His mother releases her anger and frustration by partying and hooking with up multiple men, and the house the boy lives in is a complete pigsty. The two meet when the boy flees from an abusive boyfriend of his mother’s and ends up hiding in a shed of chickens in the old man’s backyard. The man protects the child when the abusive boyfriend comes over in a huff asking if he’s seen the boy. From there, a trusting friendship grows, as the boy slowly starts to enjoy taking care of the old man’s chickens, then learns how to play chess, then spends the majority of his time with his old neighbour. As the old man and the young boy begin to learn about each other, we as the reader also learn about many secrets and guilt that are hidden in both of their lives. Through these past betrayals and lies, we see the common ground between the two, and they also begin to notice this. Their friendship becomes more than just a way to pass the time; they start to learn how to forgive one another for past mistakes and learn how to move forward from them. Moriarty was inspired to write this story by her time employed by the Australian Red Cross and sought to write about the history of families and the secrets that can often lie just under the surface of all relationships. The Promise Seed puts these secret lives under a microscope and examines just why we hide certain parts about ourselves. It’s often for very important and perfectly justified reasons that secrets are kept, and in the case of the old man and the young boy, their ultimate secret is that they loved too hard, too much, and have been punished their whole lives because of this.